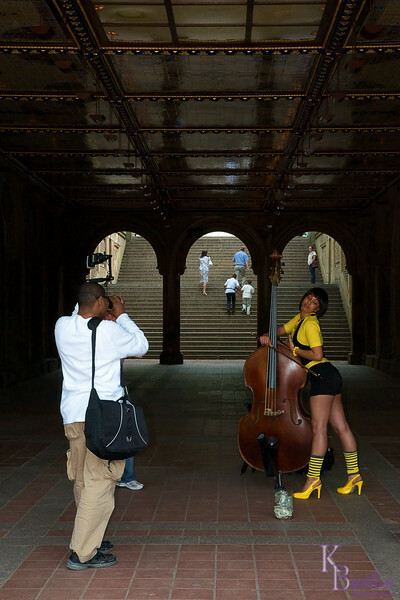 While walking through Bethesda fountain in Central Park I spotted a photographer and model (wearing a great outfit) taking pictures all over the grounds. They even borrowed a musicians cello as a temporary prop (that's the cellist foot sticking out from under the photographers bag). Their efforts made for a good shot to add to my collection. I lke the balance of all the elements in the picture, very well spotted. Great grab! What I also like is the details in the ceiling and the people on the steps! Great candid shot of another photographer in action!